Center City Hall is located at 335 Burns Avenue, Center City, MN 55013; phone: 651-257-5284. Photo: Home (foreground) at 120 Summit Avenue, ca. 1888, Center City Historic District, Center City, MN. The Historic District was listed on the National Register of Historic Places in 1980 as part of the Chisago County Multiple Resource Area. Photographed by Jet Lowe, 1990, Historic American Buildings Survey [HABS MN-117], memory.loc.gov, accessed March, 2014. In 1843, the explorer and mapmaker, Joseph Nicollet, carefully labeled this pristine body of water "Buried Eagle Lake," although his reason for doing so has long been lost. Secured by an 1837 treaty with the Ojibwa Indians, the lake (with its five distinct fingers or bays) was first called "Ki Chi Saga." Whatever its name, it and the millions of acres of uninhabited land around it, would remain Wisconsin Territory until 1849 when Minnesota Territory was established by an act of Congress, Statehood would not be acquired until May 11, 1858. Finally, in 1850 a small party of Swedish adventurers followed the St. Croix River exploring and searching for a solution to the economic conditions then present in Sweden. Three of the young men remained in what later became Washington County, but Erik Ulrik Norberg (more adventuresome than the others) pushed on for ten more miles until he came to the shores of Ki Chi Saga. A high, wooded peninsula thrust itself out to the waters, a perfect place for a village, Norberg decided. So engrossed was he with the beauty and natural wealth of the countryside, that Norberg decided to spend the winter here. Alone and facing unimaginable deprivations, the young Swede survived until spring spending some of his time drawing a crude map that he later forwarded to fellow countrymen. By the time a larger party of dissatisfied Swedes had emigtrated from Sweden and settled temporarily in Illinois. When a messenger brought Norberg's map to them with directions for reaching the utopia, the party decided to push on to Minnesota. Early in the spring of 1851, a small party of emigrants arrived by Mississippi River at Pig's Eye Landing (later called St. Paul) and booked passage up the nearby St. Croix River as far as the lumber and logging village of Stillwater. Riverboats did not travel above Stillwater because the water was too shallow. Occasional log drives, especially in the springtime, made travel dangerous. The party of colonists, however, borrowed several flat boats and with long poles began carefully making there way upstream. Soon the pine-covered riverbanks gave way to rocks and cliffs and after a while the group found themselves in a river gorge. The sound of falling water reached their ears, but before challenging the rapids, they came to a large flat rock alongside the river. It was a natural boat landing and here were several log buildings. They had reached Taylors Falls, the only non-native river settlement above Stillwater. After resting overnight, the men from the party set out to follow Norberg's map to Big Lake. After reaching the top of the river bluffs they followed old Indian trails and animal trails moving westward. Detouring around swamps and searching for high ridges, they made their way some eight miles through the wilderness until at last they reached the lake. Here, on the peninsula, on Norbergsholmen, they made their claim. After retrieving their families and remaining possessions they began to build log homes. Clearing land and planting crops was also important to them. "There are now 10 of us who started farming this summer, 9 Swedes and 1 American. Only 3 of us have families, the others are single men, but I hope that before long the population will increase significantly, for here is room for several parishes and the climate is healthful and splendid." Andersson was correct, the population would grow. By late 1851, the colony applied for status as a Minnesota County. Somehow the Ojibwa word for Ki Chi Saga was corrupted and to become "Chisago," and it was named Chisago County. The lake, called Buried Eagle and Big Lake at that time began to be known as "Swede Lake." This however, did not sit well with some of the newcomers to the region and "Chisago Lake" became the official designation. As other settlements developed around the perimeter of Chisago Lake, the little village of Swedish colonists at Norbergsholmen became the center of the larger community. It seemed natural, as its first plat map was prepared in 1858, that it would be called "Center City." In the decades to come thousands of Swedish emigrants followed the same path, as did their predecessors in 1850-51. The whole area of southern Chisago County (with Center City in the middle) became known as "America's Little Sweden." After a few years, Anders Svensson, the last member of the original party remaining in the area, platted the town site (Upper Town) in 1857. The name Center City came from its central location in the settlement and the village was replatted in 1880-1883, 1884 and again in the 1890's. The City was incorporated in 1851. The portion of Center City known as Upper Town developed as a farm center and included a variety of businesses including general stores, sawmill, hardware stores, telephone office, bank, hotel, bookshop, and granite works. Eventually many of these businesses moved closer to the train depot after the railroad came to town in 1880 or were eventually lost to fire. As the area south of upper town began to develop, known as, Lower Town, significant structure were constructed along a one block stretch known as the Summit Avenue business district or current downtown. 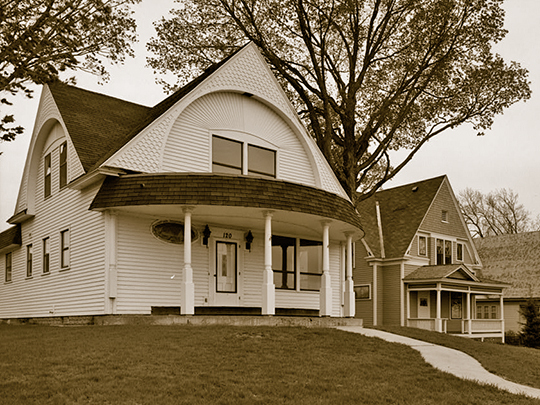 The area between Upper and Lower Town along a two block stretch of Summit Avenue, which includes the Lutheran Church and numerous turn of the century houses fronting North Center Lake, was identified in 1981 as the best collection of turn-of-the-century houses in Chisago County. This area is now known as the Center City Historic District and was listed on the National Register of Historic Places on July 21, 1980. The District contains over ninety acres and nineteen structure which are mainly Queen Anne and Romanesque in architecture. In September of 1851, Chisago County was established, with Taylors Falls as the county seat. Like many counties this was a controversial decision and the county seat was moved to Chisago City in 1862 then to Center City in 1875 to 1876 when a new courthouse was built. The original courthouse was placed on the National Register of historic places in 1990 and later was moved to nearby Almelund in 1993 by the Save the Courthouse Committee. In 1948, Swedish author and historian, Vilhelm Moberg, arrived to spend the summer researching for an historical novel. When "The Emigrants" was published it was an instant success. The book and subsequent movie of the same name have brought numerous visitors from Sweden to see the new homeland of the fictional characters Karl Oska and Kristina Nilsson. So real do Moberg's characters seem that some say they were real people. It has been reported that on a warm summer evening, these two can be seen watching over the lake. City of Center City, Planning Commission and Municipal Development Group, Inc., City of Center City Comprehensive Plan, 2009, www.centercitymn.us, accessed March, 2014.